When you work outside, you know your work boots can either help or hinder your performance. If they don’t provide the right support and comfort, you could end the day with pain and discomfort. Insoles can add benefits to your work boots to help. Below you’ll find a list of the best insoles for work boots, to offer your feet relief and relaxation; judged by their dependability, comfort features, affordability, and customer-opinion. 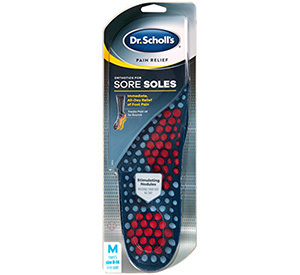 If you tend to get sore feet after a day on the job, Dr. Scholl’s makes some of the best insoles for work boots in the industry. These Pain Relief Orthotics are loaded with shock-guard technology that helps reduce the impact of every step and stop pain before it starts. These insoles are outfitted with a cool tread system on the bottom of them that allows them to spread and adjust immediately to the shape of your feet and boots. They absorb the shock that impacts your heels from standing all day and fight against general fatigue. 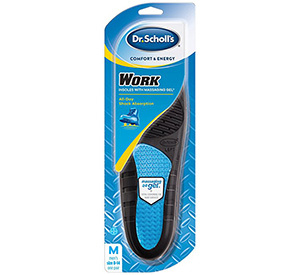 There should be no surprise that Dr. Scholl’s will make a few appearances on the best insoles for work boots list, considering their reputation and dependability. These insoles were designed for men that do more heavy-duty work and need a heavy-duty insole to support pressure and keep them moving during the toughest jobs. 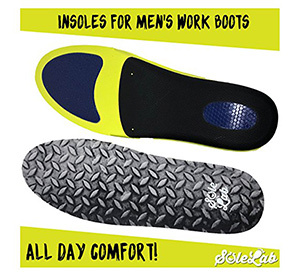 Unlike some others on the list, Sole Lab’s insoles are specially-designed for men who work on hard surfaces all day. Whether it’s construction, manufacturing, farming, and more, these gel-infused pads disperse pressure where it needs to go and adapt perfectly to the shape of your arch. 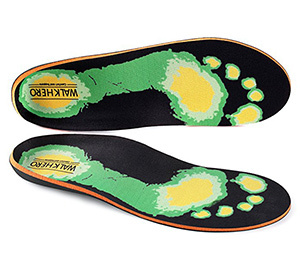 WalkHero makes orthotic insoles that help with a variety of pain problems and health issues related to the feet. 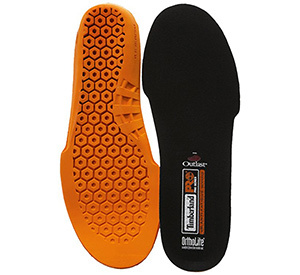 These insoles are especially wonderful for workers with Plantar Fasciitis or foot/heel problems. They distribute weight evenly and control the movements of your joints to alleviate pressure. 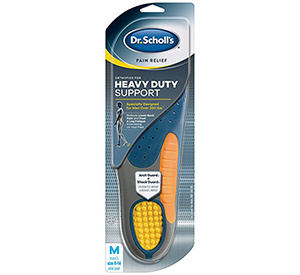 Dr. Scholl’s makes these insoles in both men’s and women’s sizes, and they’re some of the best insoles for work boots that offer you an array of benefits. The arch support, gel-wave cushioning, and cooling vents work to reduce foot-fatigue, keep your feet energized, and help them stay cool and dry all-day-long. Timberland products some of the best work-related products, from apparel to tools and accessories. 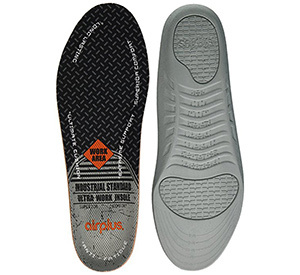 These insoles are fan-favorites among heavy-duty workers who need to stand in their work boots for hours on end. They absorb energy and return it to the proper parts of your foot, while also controlling your foot-temperature and odor. No matter what your foot needs most; whether it’s shock-absorption, energy-return, heel/arch support, or cushion, there’s insoles on this list to suit you. Try one (or a few) of the best insoles for work boots you’ve seen here and you won’t be disappointed. Which insoles are your feet’s favorite?